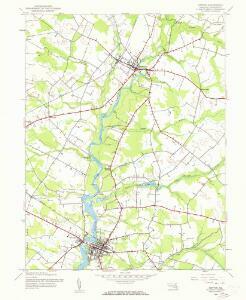 Topographical atlas of Maryland: counties of Caroline, Queen Anne and Talbot. 1 : 619000 Lucas, Fielding Jr.
1 : 630000 Lucas, Fielding Jr.
1 : 585000 Buchon, J. A. C.; Carey, H. C.; Lea, I.
Map of the Seat of War: Washington, Baltimore, Harper's Ferry and Annapolis L. Prang & Co.
Delaware / Young & Delleker sc. A map and chart of those parts of the Bay of Chesapeak, York and James rivers which are at present the seat of war / Jno. Lodge, sc.